The following application is a shoulder dislocation, or restraint. It's a mirror of the previous drill in the kata. The uchi-uke crosses your body right to left and bends the opponent's elbow. The left to right return movement rotates the opponent away from you clockwise leaving him facing away from you. The hikite with your right hand pulling to the hip pulls the opponent over and bends him over your right leg in back stance or cat stance. The gyaku-tsuki "punch" simply grabs his left shoulder. It will simultaneously free your left hand. The hook punch with the right arm, pushes the opponent's elbow up his back, and the other hand guides his shoulder down towards your left hip as you stand up from the back/cat stance. Opponent ends up face down in front of you, right arm up his back. His left shoulder approximately at your hip. 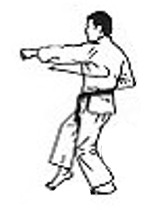 If done as the kata, he will sustain a right shoulder injury.